Ghaziabad railway station is situated on the Kanpur-Delhi section. This is amidst Howrah-Delhi main line and Howrah-Gaya-Delhi line. 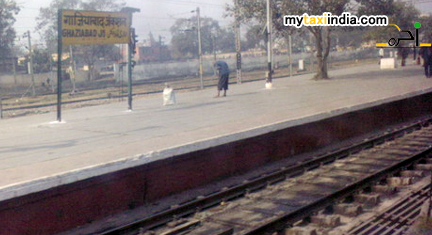 The railway station is precisely located in Ghaziabad district, Uttar Pradesh, India. It presently serves the city of Ghaziabad. Through trains for the station was started in the year 1866 on the Howrah-Delhi line of East Indian Railway Company. Later in 1898, the Oudh and Rohilkhand Railway established the Ghaziabad-Moradabad link. Between the years, 1976-77 the electrification of Tundla-Aligarh-Ghaziabad sector was completed. Recently, in 2010-11, the Ghaziabad-Moradabad line measuring 140 km long was electrified. Local electric trains are easily available from Ghaziabad for various other stations in the NCR (National Capital Region). The railway station of Ghaziabad provides a number of amenities for passengers such as waiting rooms, refreshment rooms serving both vegetarian and non-vegetarian food, water coolers, book stall, telephone booths, and computerized reservation office. The city of Ghaziabad was founded in the year 1740 by the emperor, Ghazi-ud-din. Initially, the city was named as Ghaziuddinnagar by the emperor in his name. After the establishment of railway line, the place was renamed as Ghaziabad. Since the boundary of the city is adjacent to Delhi, it acts as the main entrance of Uttar Pradesh. Hence, it is also called as the Gateway of UP. The place has some very interesting tourist destinations to visit. Thakurdwara Temple is an old Hindu temple in Ghaziabad dedicated to its resident deity possessing magical powers. The blessings of this deity have caused many miracles. The popular and tallest dam in India, Bhakra Nangal dam is only a 3 km drive from the temple. Dudheshwar Nath Mandir dedicated to Lord Shiva. It is a very popular local temple of Ghaziabad built many thousands of years ago. The place is worth visiting owing to the mythological legends associated to it. Sai Upvan is a scenic monastery which is home to the shrine of the revered saint Sai Baba. Located beside the Grand Trunk road, the grand monastery is circumscribed by serene and attractive precincts and orchards. Other famous places worth visiting in Ghaziabad include Garhmukteshwar, Mohan Nagar Temple, various malls etc. Hiring a taxi in Ghaziabad will help you enjoy the tour in Uttar Pradesh and areas around better. At My taxi India we guarantee our clients a safe and pleasant tour throughout. All you need to do is book service with us through our online portal. You may also visit one of our branch offices in Uttar Pradesh to avail services as per your requirements. Our fleet of cars is always ready for operation and well maintained by experienced engineers. The team of dedicated chauffeurs will be at your service as and when required by you.